MoonMarble.com - Glass Eye Studio Paperweight - "Caribbean Reef Environmental Series"
Art Glass → Glass Paperweights & Decor → Glass Eye Studio Paperweight - "Caribbean Reef Environmental Series"
Glass Eye Studio Paperweight - "Caribbean Reef Environmental Series"
This paperweight features the ocean floor of the brightly colored Caribbean Reef. 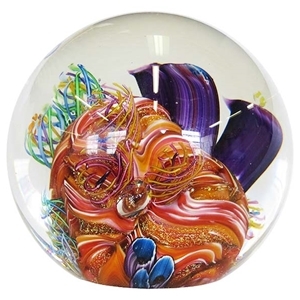 This paperweight was handmade by artists at the Glass Eye Studio. It is recycled glass and contains ash from the 1980 Mt. St. Helens eruption. Approximately 3" in diameter.